The U.S. Air Force has revoked $1 billion of launches from Boeing's Delta 4 rocket program, handing them to rival Lockheed Martin's Atlas 5 rocket, as punishment for corporate mischief during the Evolved Expendable Launch Vehicle development. In the 1990s, the U.S. Department of Defense called upon companies to develop next-generation rockets that would carry satellites into space through 2020. The EELV program's goal was replacing heritage versions of Atlas, Delta and Titan boosters with new launchers that would be cheaper and more reliable. The fierce battle to win the Pentagon's EELV competition ended with Boeing's Delta 4 rocket and Lockheed Martin's Atlas 5 as the winners. The first batch of EELV missions were split between the two rocket fleets, with Boeing getting the majority. But allegations surfaced that Boeing had acquired internal Lockheed Martin's documents, potentially giving Boeing an unfair advantage in the EELV competition. "In February of this year, the Air Force began an inquiry into the allegations of wrongdoing by The Boeing Company during the 1998 Evolved Expendable Launch Vehicle source selection. The allegations concern unlawful possession of competitors' proprietary information," Peter Teets, the under secretary of the Air Force, explained in a news conference Thursday. Teets said investigators presented him with information that "Boeing has committed serious and substantial violations of federal law. We found the following: First, the extent of Lockheed Martin proprietary material in Boeing possession at the time of EELV 'Buy 1' source selection was extraordinary -- approximately 25,000 pages. Second, the quality of information was sufficient to provide great insight into Lockheed Martin proprietary cost and pricing. Third, Boeing was not forthcoming with the Air Force about the amount of Lockheed Martin data in its possession and it took a period of approximately four years for them to provide us with all of it." In response, the Air Force has suspended The Boeing Company's Launch Systems, Boeing Launch Services and Delta Program business units from eligibility for new government contracts, transferred seven launches previously awarded to Boeing's Delta 4 rocket to Lockheed Martin's Atlas 5, given Lockheed Martin approval to develop a California launch pad and will award three new missions to Atlas 5 for a net gain of 10 launches. Under the original EELV "Buy 1" contract in October 1998, Boeing's Delta 4 rocket received 19 missions and Lockheed Martin's Atlas 5 was given 9. 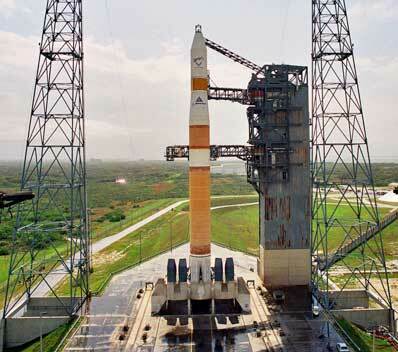 A few months later, two payloads in the Delta 4 column were cancelled. But Lockheed Martin would ultimately decide against building a competing launch pad at Vandenberg Air Force Base in California, thereby forfeiting two of its EELV missions to Delta 4. The Boeing total was back at 19, while Lockheed Martin's fell to 7. Although not part of the initial orders, the Air Force booked a qualification launch on Boeing's Delta 4-Heavy rocket to demonstrate the big booster works. That gave Delta 4 some 20 flights for the Pentagon. To date, one Air Force EELV launch has been carried out by Delta 4, successfully lofting a military communications satellite earlier this year from Cape Canaveral, Florida. On Thursday, Pentagon officials yanked seven launches from the Delta 4's schedule, dropping the number of future Air Force flights to 12 vs. Atlas 5's 14. What's more, three launches as part of the EELV "Buy 2" contract will be awarded to Atlas 5, putting the tally as 12 vs. 17. For the Delta 4 program, 10 of the launches will occur from Cape Canaveral and two from Vandenberg Air Force Base, California. The Atlas 5 backlog features a dozen Cape missions and five from Vandenberg. Until Thursday, Boeing was the only EELV provider to build a West Coast pad to launch satellite cargos into orbit around Earth's poles. Now, two of the "Buy 1" launches being shifted to Atlas 5 and the three "Buy 2" missions Lockheed Martin is getting will occur from Vandenberg Air Force Base, located about 140 miles northwest of Los Angeles. "Boeing has a clause in its current contract that gives Delta 4 the only West Coast launch capability. We are ending Boeing's West Coast launch exclusivity and we will permit Lockheed Martin to develop a West Coast launch capability at Vandenberg Air Force Base. This will provide a second launch service capability on the West Coast for assured access to space," Teets said. "We intend to contract for the upgrade to Space Launch Complex 3 at Vandenberg in the same way that we contracted to built pad 41 on the East Coast -- namely, Lockheed Martin will finance through either their own source or through limited liability corporation and we will lease services from that pad." The cost to transform the pad from its current Atlas 2AS configuration into a complex suitable for the larger Atlas 5 is estimated to be $200 million, Teets said. One more Atlas 2AS rocket is awaiting liftoff from the pad. It is slated to fly November 20 carrying a classified National Reconnaissance Office payload. Boeing has spent an undisclosed amount of money rebuilding the abandoned space shuttle launch site at Vandenberg for Delta 4. Boeing completed an initial round of testing with the rocket on the Space Launch Complex 6 pad in May. As the new launch manifest now stands, Boeing has two Vandenberg missions scheduled on the Western Range in July and October 2004. The first will launch a secret NRO cargo; the second carries a military weather satellite. Lockheed Martin's missions -- commencing in 2005 -- include four for the NRO and another polar-orbiting weather satellite. A fourth launch as part of "Buy 2" has not yet been assigned. "There is one remaining launch to be awarded. 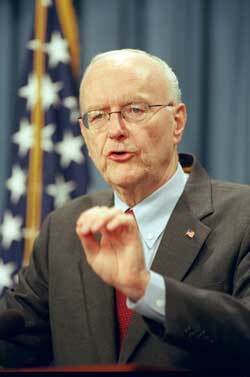 We will give due diligence and consideration to that in the coming weeks," Teets said. How long is Boeing's suspension? The suspension against Boeing could be lifted later this year before the EELV "Buy 3" launches are awarded. That batch will include 15 to 20 missions. "Boeing is responsible and must be held accountable for the actions of its employees. However, it is my sincere hope that The Boeing Company moves quickly to take meaningful corrective actions so that this suspension can be lifted and they may be allowed to compete in future launch competitions," Teets said. "I would think if Boeing has a strong response to this suspension, if they immediately start to put in place corrective actions, training of employees, employee hotlines, and drive the integrity ethic down through the organization of these units, I would think that their suspension could be lifted well in advance of the 'Buy 3' EELV competition." Boeing announced last week that former U.S. Senator Warren Rudman is heading an independent review of the company's policies and procedures, including ethics and the handling of competitive information. "His review will include looking at any management or cultural factors that could affect how these policies and procedures are respected and enforced," said Boeing Chairman and CEO Phil Condit. "To reinforce the impact unethical behavior has on the customer and the company, a stand-down will take place on July 30 for all 78,000 employees in our Integrated Defense Systems business unit," Condit announced Thursday. "These employees will be briefed on today's action taken by our Air Force customer and the events that caused it, and participate in specialized interactive ethics and procurement integrity training." "I am very, very anxious that Boeing treat this problem seriously, take it seriously and make certain that integrity is built into this operation," Teets said. "We cannot tolerate anything less than complete honesty in our procurement process and we believe this suspension and launch reallocation is necessary. Everyone who does business with the Air Force should take note that we expect nothing less than the highest integrity standards." In 1997, Boeing hired former Lockheed Martin employee, Kenneth Branch. He worked as a senior engineer/scientist on Boeing's EELV program. But after allegations surfaced about Lockheed Martin documents, Boeing fired Branch and William David Erskine, a former ground operations lead on Boeing's EELV program. In addition, Larry Dean Satchell, a former member of Boeing's EELV proposal team, left Boeing. All three are suspended from participating in new government contracts, the Air Force said Thursday.